Chinese scientists for the first time have successfully positioned a satellite to circle the orbit module of the Shenzhou VII spacecraft. 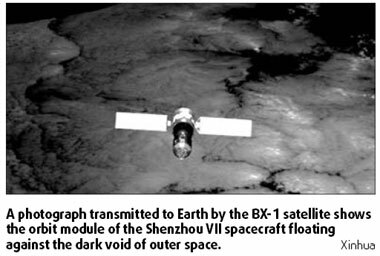 The BX-1 satellite began circling the module on an elliptical track of 4 x 8 km at 6:14 pm on Sunday, official sources said yesterday. The satellite was carried aloft by the Shenzhou VII on Sept 25 and launched by the spacecraft into the space two days later after astronaut Zhai Zhigang finished the country's first spacewalk. Since Sept 30, the Aerospace Control Center had changed the satellite's track six times to position it closer to the orbit module. Over the past few days, the BX-1 satellite has taken more than 1,000 pictures of the orbit module from various angles and relayed them back. All the pictures are clear, an official with the space program, said. The photos have been condensed and stored on board the satellite. The BX-1 took its first photo six seconds after being released. In one of the pictures, the module resembles an eagle in flight. Experts said the success of the launch and positioning of the small satellite will pave the way for the country to monitor large aviation instruments in space and detect their malfunctions.